FOUJITA was screened as part of Japonismes 2018. The film was released in Japan two years earlier, but had trouble getting distributed in France due to a number of snags, including the bankruptcy of the French production company that co-produced it. As a result, the Japonismes 2018 showing marked the film’s formal debut in Paris. Tickets sold out quickly, and on the day of the show a line of people hoping to get seats from last-minute cancellations formed outside the venue, the auditorium of la Maison de la culture du Japon à Paris (MCJP) . Both the cast and crew had also been eagerly awaiting that day, adding to the fervor that pervaded the screening. At the same time as this event, the MCJP was also hosting Foujita, Works of a Life (1886-1968), a retrospective of Tsuguharu Foujita’s paintings. 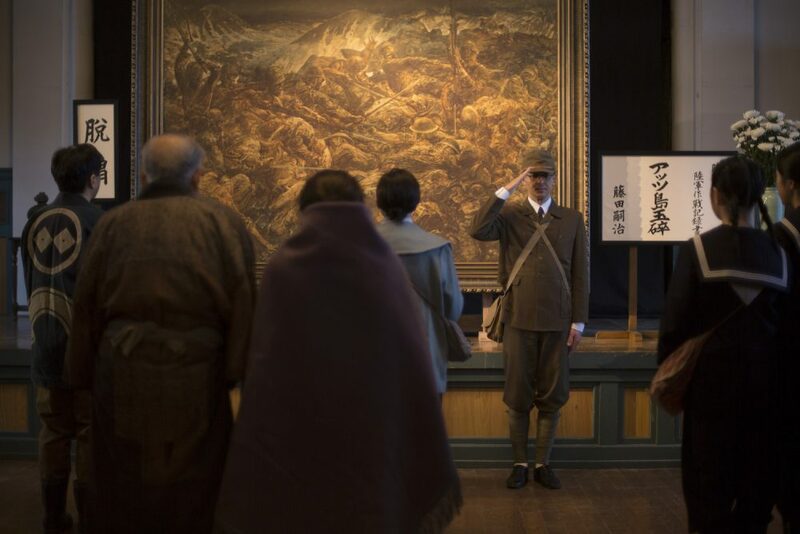 The exhibition included two of his sakusen kirokuga ( “war campaign documentary painting”), a genre of war paintings. Foujita’s war paintings are almost unknown in France. Following World War II, the sakusen kirokuga by Foujita and other artists were confiscated by the Occupation forces. For many years, those paintings lay dormant in the United States without any decision made on whether they constituted art, or propaganda. They finally returned to Japan in 1970 in a transfer that was curiously styled as an “indefinite loan.” The retrospective in France was the first time for Foujita’s original war paintings to be publicly exhibited outside Japan. FOUJITA juxtaposes Foujita in the 1920s, when he was the darling of the School of Paris, with the artist who painted a stream of sakusen kirokuga in Japan before its defeat in World War II. In crossing those two eras, Foujita underwent an astonishing gap in both his painting style and his lifestyle. Today, it is still difficult to unravel what it was that drove him at a profound level throughout his lifetime. Japonism is not just a one-way flow of fascination with Japan to Europe. It is also a manifestation of the struggle embodied by the encounters with Europe that Japanese experience in the rebounding wave. During the filming, the crew often asked me, “Why don’t you move the camera during long shots? Why don’t you shoot close-ups of the characters?” I told them that it had to do with something expressed in Japanese as “kane no oto ga kikoete iru” (hearing the bell toll). There’s no clear subject in this expression. Japanese culture sets greater store in conveying the overall mood of a situation, rather than stating in detail who did what. Needless to say, this sort of explanation doesn’t really get the point across. Following this screening, FOUJITA was shown at a cinema called L’Arlequin. Film director. Born in Gunma in 1945. 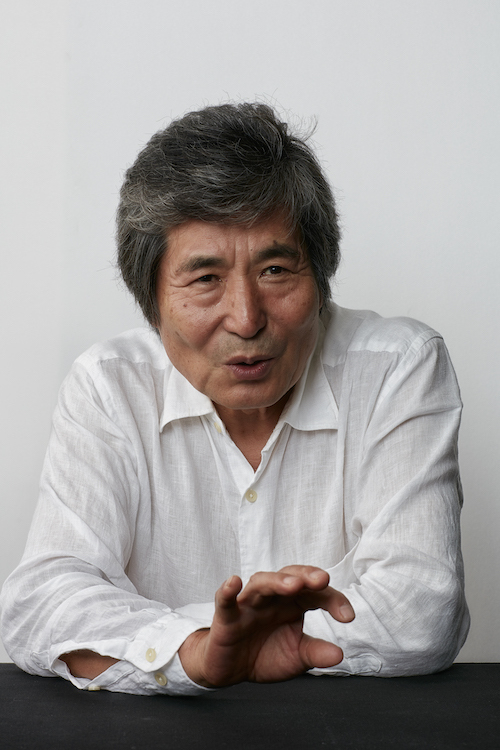 Made his directorial debut in 1981 with Muddy River (based on novel by Teru Miyamoto), which was nominated for the Academy Award for Best Foreign Language Film. He received the Georges Sadoul Award for For Kayako (1984, based on novel by Lee Hoesung). His The Sting of Death (1990, based on novel by Toshio Shimao) captured both the FIPRESCI Award and the Grand Prize of the Jury at the 1990 Cannes Film Festival. Other works include The Sleeping Man (1996), The Buried Forest (2005), and FOUJITA (2016).